150 Microns UV Resistant Elastomeric Exterior Coating is a single component elastomeric high build coating for exterior concrete surfaces. It is based on the selected polymer which gives it unique elastomeric, UV resistant waterproofing coating. 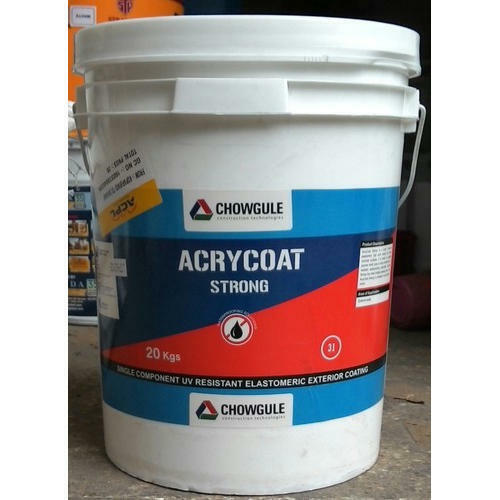 AcryCoat Strong has crack bridging capacity up to 1 mm. AcryCoat Strong is available in wide range of colors. Incorporated in the year 2012, at Pune (Maharashtra, India), we, "Construction Chemicals Corporation", are recognized as one of the leading distributors, traders and wholesaler of premium quality Waterproofing & Admixtures. The product collection that we bring forth includes Waterproofing Coating, Polysulphide Sealant, PU Injection Grout,PU Sealant Gun etc. The offered products are procured from renowned and trustworthy vendors of the industry, who process these in conformity with the defined industry standards. Our products are formulated using high grade chemical compounds and advanced technology at our vendors’ hi-tech processing labs. Moreover, we are also the authorized dealers for Sunanda Speciality Coatings Pvt. Ltd. (ISO 9001 Company-Manufacturing Specialty Chemicals since 1979), STP Limited (Formerly known as M/s Shalimar Tar Products-In market since last 70 years) and MYK Schomburg (I) Pvt. Ltd. (Indo-German venture-World Class Construction Chemical products).